International LGBTI Support is going to organize some events around Europe to promote the protection of the fundamental human rights and support the right of asylum for all people who escape from violence and discrimination because of their sexual orientation or gender identity. In the last couple of years, Europe and the European countries have been involved in the fight against discrimination the immigration issues. Our goal is to put the two themes together and show the two sides of the same coin. We can work all together to improve the situation. Our association would like to present the events in some important cities like Bologna, Rome, Geneva and Brussels. In the last five years, International LGBTI Support has been working hard in researching, raising awareness, supporting the refugees LGBTI and promoting the tolerance of homosexuality. The themes of this journey are interesting and they involve many European countries. All the workshops organized at the end of every conference will help us to take specific initiatives in order to support the Refugees LGBTI in the European Union, facilitate the asylum requests and improve the quality of camps, where refugees are often victims of violence and discrimination. The main goal of the International LGBTI Support is to promote the projects proposed by the ONG and support the promotion of the International Human Right, the defence of sexual minorities and the commitment of the EU in the fight against the discrimination. Every Conference aims to inform, raise awareness, unite and involve both the ONG and the institutions in a cohesive enterprise that could improve a system currently under threat. Four speakers will attend every conference and they will give an overview about the key points of LGBTI immigration in Europe. They will help us to learn more about what the ONG do proposing ideas in order to improve the system. At International LGBTI Support we have identified some of the mail subjects of our debate, that will be presented below. 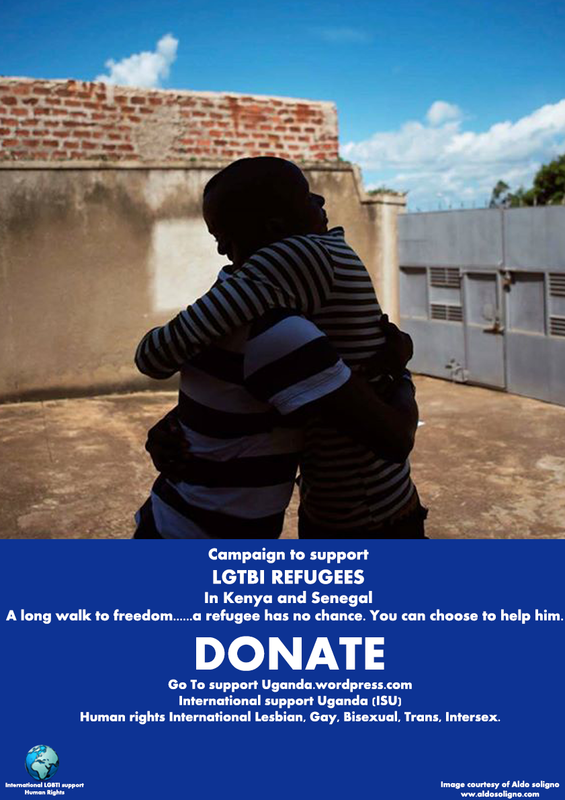 For some time now, the programme Support Uganda directed by Tobias Pellicciari deals with the situation of LGBTI refugees in Kenya and their daily difficulties. In order to better understand our mission, we will start from Uganda, where all has begun. Then we will talk about Kenya, that hosts all the LGBTI Refugees who are currently waiting for the resettlement and the asylum. We will eventually arrive in Europe to analyze the situation in many European countries about the asylum for the LGBTI refugees. We will pay particular attention to the refugees in Kenya that in the last few years have faced violence, intolerance and tension caused by the instability of the system. This problem has been exacerbated by the lack of funds and the constant threats received from the government that wants to close the camps. You can find all the details and the info about our debate in the link below at the end of this page. As announced from the United Nations, the risk that the camps in Kenya will be closed is a real one. On one hand this depends on the situation of refugees from Somalia that has been getting unsustainable in the last few years. On the other hand it can be caused by the huge economic difficulties of UHNCR and HIAS in getting funds for the refugees. This doesn’t help the situation for the settlement of the LGBTI refugees. Firstly we will try to understand how UHNCR works and how the refugees are registered for the resettlement together with the difficulties they have to face. Introducing the theme of resettlement in Europe, how does it work? What are the countries who accept the LGBTI refugees and which kind of system do they use? What are the difficulties refugees face with? Our mission is to answer all these questions. Secondly we will deal with LGBTI refugees detention in some of the European countries, trying to understand how the UE will assure their human rights. We will also analyze, together with the speakers, which difficulties homesexuals face in everyday life during the detention, that can be longer than expected. Among their difficulties, it’s important to mention the violence, the healthcare difficulties, especially the HIV and the hormonal dosage for transgenders that are not guaranteed. To assure more rights to LGBTI people all the necessary measures should be taken to provide healthcare to the homosexuals, following the principles of equality and nondiscrimination, in relation to their own sexual orientation and gender identity specified by the UE. If their security during the detention is not guaranteed, they should be released. At the LGBTI Support we truly believe that the exclusion is not the right way to protect the individuals. Thirdly, we will deal with the civil service “technical” issues that the European Union is facing. For instance, there are still some UE countries allowing the discrimination of LGBTI people during the procedures for the asylum. Even though the law of the 2nd of december 2014 of the Court (you can find the text attached at the end of the page), identifies the procedures that national authorities should follow to value the sexual orientation of people looking for asylum, we have noticed that some European countries are still asking “personal” questions that can violate the right of privacy. Our goal is to avoid the violation of the right of privacy and personal life. We will focus on this matter and our collaborators will answer to these following questions: “What is the UE doing to promote support and nondiscrimination programmes so that the countries can use the “good regulations”? To summarize, we will talk about the LGBTI people being discriminated in some European countries, the non-acceptance of the sexual orientation and the gender identity caused by different cultures or ignorance. The goal of our programme is trying to understand how we can prevent this issue through the education and the raise of awareness about this matter so that people can accept the sexual orientation and identity. In order to do so, we will focus on Netherlands that in the last few years has been working to develop brand-new welcome programmes for the LGBTI refugees. This country has promoted the education and the tolerance through seminars in the camps. At the end of our Conferences we will organise workshops where we will invite guests to discuss about some projects and the best one will be taken in consideration for a future partnership. Please keep in mind that the Conferences aim to discuss the international realities, the collaboration among the attendees and the Nations fulfilment. We hope all the attendees and the European Union join forces and give more dignity and support to the LGBTI refugees in Europe. Detailed documentation about the lifestyle conditions of LGBTI refugees requesting for asylum. Questo articolo è stato pubblicato in Africa, International ed etichettato International Support - Human Rights.